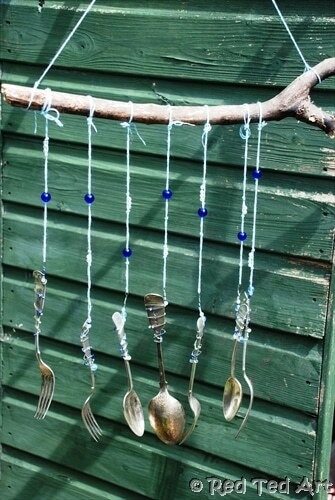 I made this Fork & Spoon Wind Chime almost a year ago (wow, time does “fly”). At the time it was for the Tesco Summer Magazine. Wonderful to be featured there along side some of our cardboard tube pirates and saltdough dinosaurs. All great activities for long holidays. 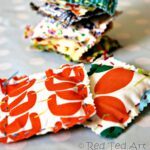 Finally, it seems like a good time to share this craft with you – Spring is in the air and we are slowly looking forward to spending more time in garden – planting seeds soon, but I also hoping to make our very small garden more child friendly and interesting – hoping to sort out a drawing “station” and maybe a music station. Let’s see what we manage! 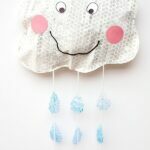 But in the meantime, I have some easy and fun wind chimes for you – great for that tinkering and tingling in the garden! 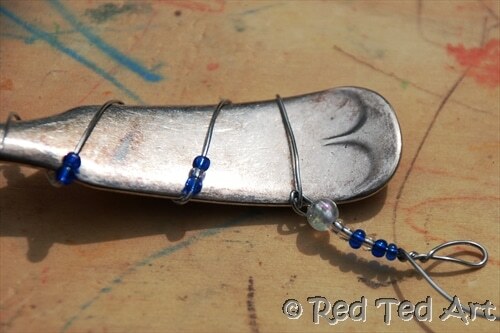 3) Start winding it around the handle adding beads as you go. Add a little loop at the top from which to tie your string next. 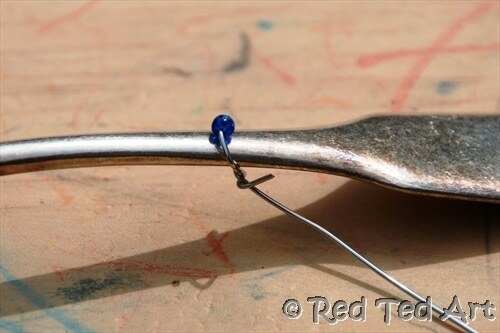 4) Add a bead or two to your string an attach! 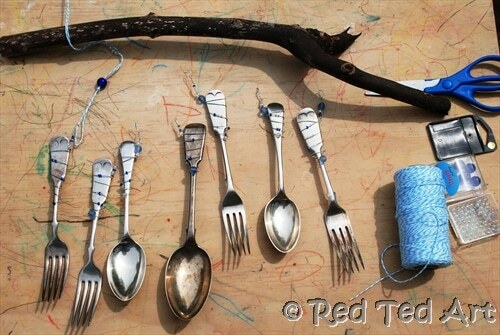 Repeat with all the wind chime cutlery. Then attach them to you stick. 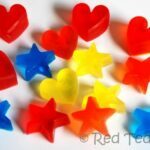 Remember you want them all spaced out evenly, but not too far apart – you want them to be able to bang together and give you that tinkering tingle! Finished, hang in a windy area and enjoy! Now you really can hear the wind in your garden? Is it a windy day today or a calm one? Red Ted loves listening out to the chimes and hearing what is going on with the weather! 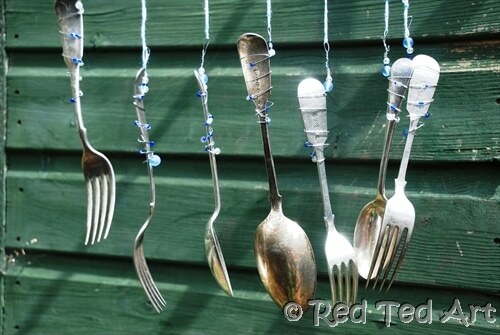 Enjoy your cutlery wind chimes! 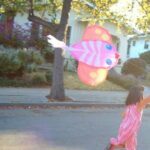 How To.. make a Beautiful Kite! 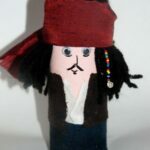 Quick Craft Post: Loo Roll Guess Who! Well, that\’s a thing I wanted to make for years. Time to visit a flea market. 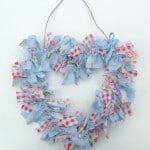 Beautiful crafting! Yes, the flea market is perfect for picking up the needed cuttlery! Thank you for the kinds words!! I found myself actually saying \”Oooh\” as I read through your instructions. Not only is this lovely, it\’s very easy. I was imagining the inclusion of a drill with special bit on the end at some point during the instructions, but no. Thank you. Oh no, no drills or banging in my house!! they are really pretty. I\’ve seen some done with curled fork tines – not sure how you bend them though. Oh yes the curled ones are lovely!! But that requires a whole new set of skills (and patience… that I don\’t have ;-)). Love all the curled fork bracelets and key rings too! Fantastic, might have to have a try of this! I\’ve been meaning to do this for ages, thanks for the much needed instructions! Oooh so pleased, Ladies!!!! Would love to see any pictures if you do get a chance to make any! This is so pretty. I love the bead-work. I may have to try making this for my garden. What does it sound like? Is it very loud, or just a soft clinking noise? This is wonderful and beautiful! I can imagine the noise it makes. I love that it uses old cutlery, reminds me of dinners at my grandparents. You\’ve inspired me with another project to embark on! @ Lydia – have fun!! What an amazingly simple and brilliant idea! 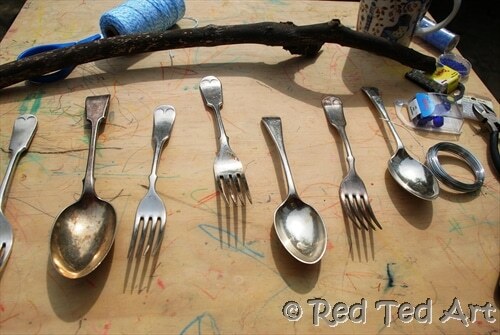 I will go and buy some fancy old spoons from a thrift store and get crafting. Thanks so much for sharing. I have a box of old silverware from my grandparents home. 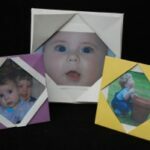 I have been wanting to make a set of these for each of the grandkids, but like your other reader I thought it would involve drills and more skill than I have. These are easy and very pretty with the wire. You have been the impeus I have needed to get these done!!!! Ohh I love this. Just the thing for our backyard! Thank you for the inspiration!